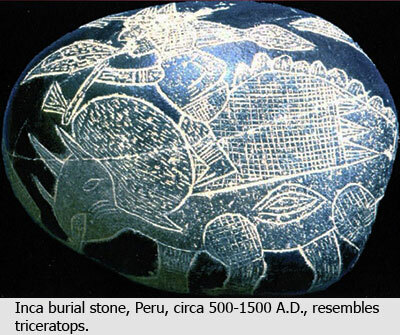 Ica Stones: Inca Burial Stones Show Incas Met Triceratops? The Ica stones are purported to have been carved by Inca indians before A.D. 1500. Today I saw my first Ica stone, and I found it the most astonishing evidence I had every seen for the co-existence of humans and dinosaurs, in particular triceratops. Take a look at this picture! How would I ever refute this? I got this image from Understanding-Creationism.com. The image is all over the internet. There is no mistaking this image as a triceratops. The three horns in the correct place on the face and the bony frill around the head identify it to us all. On the other hand, the plates on its back are mistakenly inserted from the stegosaurus. Triceratops did not have those bony plates. Despite this minor flaw, if this burial stone is really from a pre-1500-A.D. Incan civilization, then it would argue powerfully for the co-existence of man and dinosaur. As I said earlier, I was puzzled when I saw this. Is it possible that I've overstated the evidence, I'm overconfident, and I'm missing creation evidence that ought to be staring me in the face? I'm not a suspicious person by nature. Stupidly, because I was reading the site of a Christian, and one with whom I've corresponded, it never crossed my mind to consider that the Ica stones are simply forgeries. Surely, if there was a question about the stones' validity, he would have mentioned it among the arguments he gave for the "evolutionist" response to the stones. ... found by huaqueros after a flood on the Ica river in 1961. The huaqueros henceforth made a living selling them to tourists. ... carved by the huaqueros themselves to sell to tourists. The first of these possibilities is suggested in the introduction of a book called Introduccion al Peru by Herman Buse, which is cited by the late Dr. Javier Cabrera Darquea. He both founded a museum dedicated to the stones, which still exists near Ica, Peru, and wrote a book called The message of the Engraved Stones of Ica. Excerpts of this book are preserved on the web. The second possibility, that the huaqueros carved the Ica stones themselves, is based on a rumor that Dr. Cabrera heard. Is There Any Scientific Evidence That the Ica Stones are Genuine? Dr. Cabrera's book makes it clear that neither he nor anyone else has done any excavations to prove the validity of the stones. He explains that the Patronato Nacional de Arqueologia turned down his request to excavate in the area and that he never found anyone else interested. A colleague told him it was unnecessary because he had heard that the huaqueros carved the stones themselves. Could someone argue that it is not "proven" that the stones are forgeries? No, but we can say that there is no evidence whatsoever (see next section as well) to indicate that the Ica stones in general are authentic. Further, there is good reason to believe that even if some Ica stones are genuine, the one pictured above is almost certainly a forgery, not making its appearance until recently. There are rumors, mentioned in Dr. Cabrera's book and on other web sites, that Inca burial stones were sent back to Europe by the first conquistadors. I have searched the internet enough now to be convinced that story only exists in the form of local rumor, and there is no way to determine its truth. Either way, there are no stones from the 1500's, nor even from the early huaquero days of the 1960's and 1970's that look anything like a specific species of dinosaur, such as we find with the triceratops pictured above. The first edition of Dr. Cabrera's book was written in 1976. It contains photos of Ica stones that he considered meaningful. While you may or may not find the depictions of supposed brain and heart transplants convincing, you will find nothing resembling a specific dinosaur species, despite the fact that a couple have triangular plates on the back, far more resembling Puff the Magic Dragon than a stegosaur. Such depictions very likely hark back to huaqueros selling to tourists than to Incans depicting an animal they had seen. In fact, a Skeptical Enquirer article (Massimo Polidoro; "A Pterodactyl in the Civil War" 2002) reports that two huaqueros, Basilio Uchuya and Irma Gutierrez, sold stones to Dr. Cabrera with drawings they'd obtained from "comic books, school books, and magazines" (cited by The Skeptic's Dictionary). I agree with Dr. Cabrera that most of the stones in his collection are genuine antiquities. Some stones are probably fakes, though, and it is widely known that some stones (outside of his collection) were manufactured in recent times to be sold to the tourists who came to Ica. However, like a hoaxed crop circle, or a counterfeit twenty dollar bill, the existence of one or more fakes should not be used to condemn an entire type of object. The trick is being able to identify the real ones from the fakes. I have no problems concurring with this opinion. In fact, he follows it up by giving some excellent hints for distinguishing potential real stones from obvious fakes. What About the Lab Tests on the Ica Stones? The lab report says that a patina of natural oxidation exists "by which their age should be able to be deduced." Unfortunately, the lab did not have the equipment to deduce the age. Here the lab says that the etchings were done shortly before being deposited in the graves "or other places where they were discovered." There is no indication of age here. This simply means that the stones were etched with a tool and then not handled much afterward. They had simply sat, naturally oxidizing, but not being worn by hand or natural processes. This could have happened in a cave, or this could have happened on a huaqueros tourist table after he carved it. How does one produce "a patina of natural oxidation" that would fool a 1960's laboratory? Gutierrez and Uchuya, mentioned above, explain that you simply lay the stones in a chicken pen and let the chickens do the rest. Is There Any Further Research on the Ica Stones? No, and this is no insignificant point. With minimal searching, I found several creationist web sites expounding the authenticity of the Ica stones. A search on Google with terms such as "ica stones triceratops" or "ica stones creationism" will help exclude all the alien sites touting the stones. Even large anti-evolution organizations like Answers in Genesis mention the stones, saying, "Skeptics have claimed, though without proof, that they are modern forgeries." Really? Here is one of the most significant evidences ever found against evolution, and not one creationist organization has found it worth their effort to complete the lab results begun by Dr. Cabrera? Does this not trouble you? One of my strongest arguments against the anti-evolutionists that they don't want to know what's true. I assert that, deep down—either in their subconscious or in their conscience, which would be more troubling—they know that they are wrong. As a result, they must stop before going too deep into the evidence. Suppositions, hints, and vague possibilities are in their arsenal, but digging after truth is not. The Ica stones are simply one more example of this unsettling anti-evolutionist habit.